There’s a new personal injury lawyer in town (or at least a new one advertising on TV) . . . Sam Harding (pictured above -- complete with cowboy hat). You know times must be tough … even for lawyers…based on the amount of lawyer ads running on TV these days -- or perhaps it is an indication that TV stations have lowered their ad rates for TV commercials to such a level that such advertisements are now more cost effective for attorneys, but I digress. 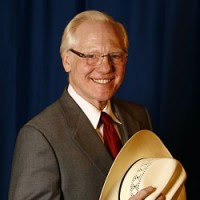 When lawyers in Las Vegas think about advertisements using a catchphrase that begins with “The,” most of us immediately think of “The Heavy Hitter” . . . excuse me, “Heavy Hitter” Glen Lerner. 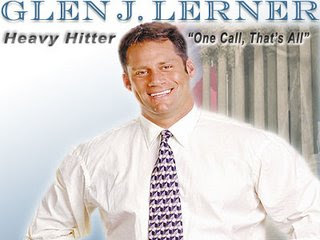 Described in my prior blog post here, Lerner once had a run in with the State Bar of Nevada over his use of “The Heavy Hitter.” Sometime in 2001, Lerner began promoting himself as “The Heavy Hitter” in connection with his legal services. While the ad campaign grabbed the attention of the Las Vegas public (indeed, I think most people still describe Lerner as “The Heavy Hitter” although they’ll say it with a grin), it also got the attention of the State Bar of Nevada, who told Lerner that calling himself “The” Heavy Hitter was false and misleading because it’s a statement that he is the only heavy hitter. Instead, the Nevada Bar told Lerner that he could only be “a” heavy hitter. Click here for a Las Vegas Review Journal article on the “heavy hitter” dispute between Lerner and the State Bar of Nevada. (I'm sure Lerner considers himself a Good Guy too)? Which begs the question – is Sam Harding calling himself “The” Good Guy false and misleading because it’s a statement that he is the only good guy? Of course, I know several people who would argue that any lawyer using the phrase “Good Guy” in connection with their services is false and misleading, but that’s another issue. The Nevada Supreme Court changed its rules on attorney advertising back in 2007 (click here for article on the change). On the one hand, the rules were relaxed to no longer prohibit advertising that was been considered “bad taste” in the past. On the other hand, the Nevada Supreme Court also implemented a much stricter requirement that attorneys submit copies of their ads to the State Bar for review within 15 days after publication or broadcast – and if the Bar deems an ad to be inaccurate or misleading, then it must be pulled. So assuming that Harding followed Supreme Court Rules and submitted his ad, then, depending on how long ago it was submitted, there is a chance that the ad may have already been reviewed and deemed suitable by the State Bar. So if Harding can call himself “The Good Guy,” does that mean that Lerner can finally go back to calling himself “The Heavy Hitter”? Assuming, of course, that Lerner can overcome the trademark infringement battle in which he is currently embroiled over his use of the “Heavy Hitter” mark (discussed in my prior blog post here).